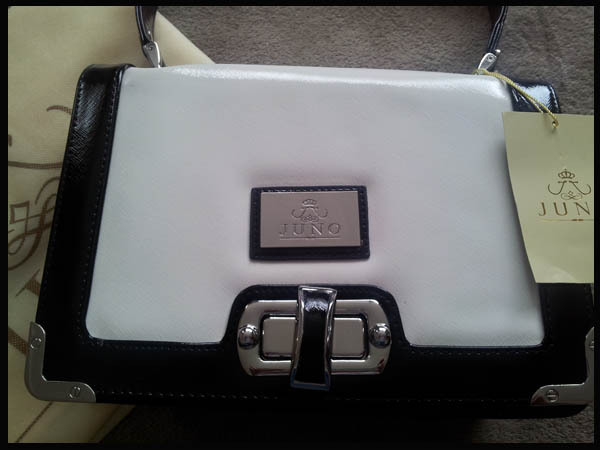 #Juno #BBloggers #FBloggers - How fabulous is this bag! Last week I was contacted by Bagable.co.uk to review their Juno Across Body /Shoulder Bag and I can say I am not disappointed with it. The black and white contrast means it can be worn with pretty much anything and everything. It can be used for casual with your jeans or formal with a black dress and anything in between. I find the solid form makes it a lot easier to find things inside. I don't know about you but I'm forever pulling items out just to find my lippy! It has a zip pocket section at the back, a slim pocket section at the front and the all important pocket for your mobile. This is a good size bag that will fit your essentials in and the flap over and twist lock sets the bag off perfectly. I find the only drawback with this bag is it is not an across the body bag as the strap is not adjustable but can be used as a shoulder back quite comfortably. Bagable has a variety of handbags, purses and accessories and I have spent a lot of time checking out the bags on the website.